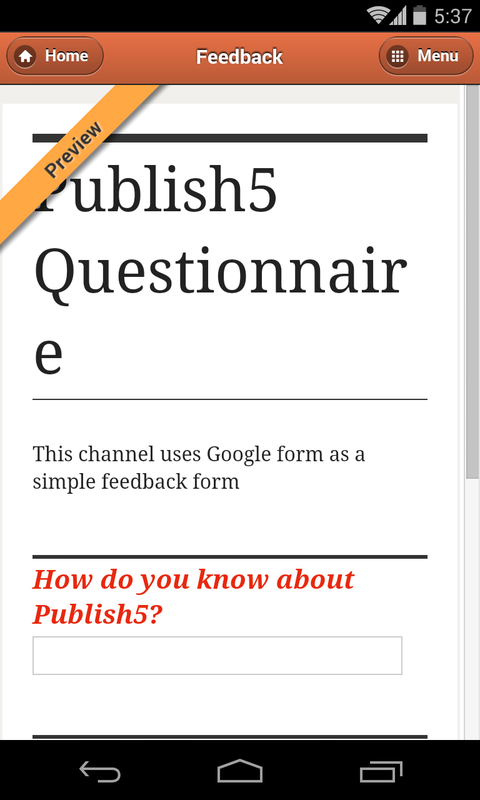 Publish5 allows you to create your App content easily with different type of channels, including dynamic channels (for feeds and videos) and static channels for information like contact, address, links. In the latest version, we have added another new type of channel that could enhance the functionality of your App significantly. You can now embed simple webpages into your App. There are many ways to utilize this channel, e.g. by simply adding a Google Form URL then you could have live feedback or order form for your users. Or if you (or your friends) are capable for producing simple HTML pages, you can design specific pages to put into the App. If you decide to add a custom page from your website, remember to make sure it will scale dynamically on different mobile devices. As mobile devices usually have less computing power, your pages should be simple and it should load fast. To experience the latest features, just log in publish5.com to modify your app design, then use the latest version of "Publish5 Test Client" Android App or check the live preview on your iPhone. For information on how to manage your content, check out this page as well. Publish5 is the simplest way to DIY your own mobile apps. Create your Android App here now! Copyright © 2011 Visibo Limited. Powered by Blogger.